One of the most popular rides at the Santa Cruz Beach Boardwalk is being retired after nearly 60 years of "faithful service," altering the boardwalk’s skyline forever. The popular beach boardwalk took to Facebook to announce the removal of their Ferris wheel which debuted in 1959 and was dismantled Monday. "We know many guests love the Ferris Wheel and we do too!" the post read. "We'll be looking at replacement options and will keep you posted." Adding that one of their favorite memories is from a 2011 visit by "the legendary" Nik Wallenda and adding a photo of the acrobat and aerialist on that day. Seen on the very top of the wheel, the photo made headlines around the world. "Ferris wheels are an iconic part of seaside amusement parks, so it's been very popular over the years, and it's very beloved," Boardwalk spokesman Kris Reyes said, "But after 60 years, it's time to look at new and different options." She added that there are currently no plans to sell the ride, and no decisions have been made regarding the Ferris wheel's successor. The boardwalk is looking for a new ride to fill the space the Ferris wheel leaves behind but the timetable is not yet known. 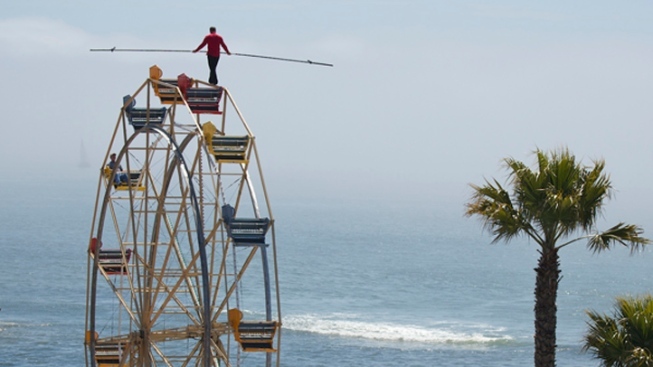 According to the Santa Cruz Beach Boardwalk Facebook page, the Ferris wheel had more than 4 million riders since 1986 alone — they did not track the ridership before that.